Time gets into all grooves. We can clean your old crackly records. See the compared wave forms below for the difference in sound before (top) and after (bottom) cleaning an old record that looked perfectly clean. $5 per disc (both sides) - contact us. Finger grease and other stains (beer / food / blood) can be removed with record cleaning spray and a lint free cloth - note the cloth that comes with this bottle is small and will wear out LONG before the bottle does. best guess says you'll need 4 more, which we happily sell. $3 each. You definitely need one of these. Clean your needle after EVERY LP and you'll extent the life of your vinyl considerably. More realistically, clean it one a session. Seriously, you clean your vinyl but it only gets played once and what plays every record? Your needle. A dirty needle is no one's friend. This is an expensive option, but highly effective. This cleans and restores your precious vinyl records without the use of expensive mechanical record cleaners, three step washing processes or petrochemicals. 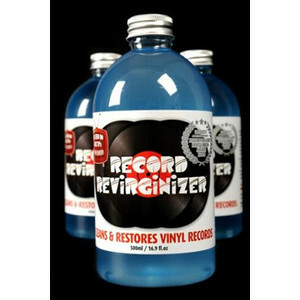 The university Award Winning RECORD REViRGiNiZER will clean your vinyl records thoroughly and remove the pops and crackles from your valuable record collection.